The SoCal drought is a hot topic and everyone’s coming up with ways to conserve water. I’ve been contemplating cutting back on my red meat consumption and since livestock is a significant portion of California’s water usage, it seemed as good a time as any to start. Eating less meat poses a significant challenge for me given that my main food groups are meat, dairy, and carbs. I think my intestines would prefer that I not survive on cheese and bread, so I really need to increase my fruit and veggie intake. In honor of meatless Monday I’ve been playing around with my own version of this sweet potato and black bean quinoa bowl. 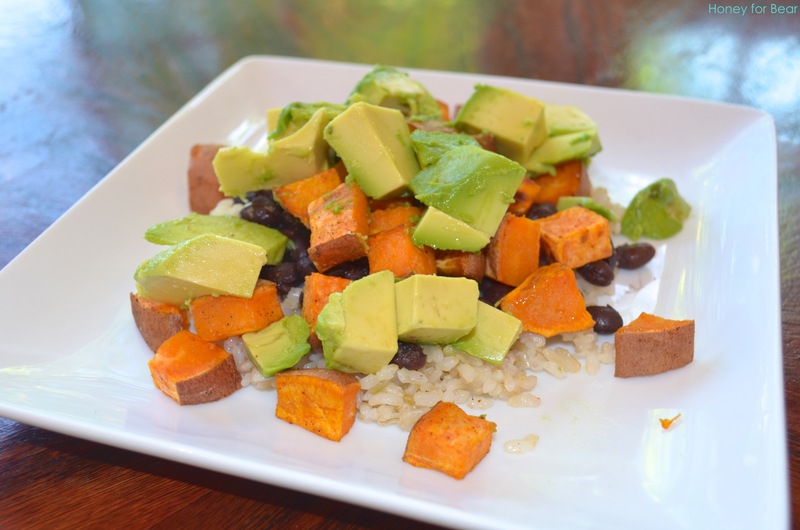 I love sweet potatoes and this dinner is like a meatless burrito bowl. Instead of quinoa I used Trader Joe’s frozen brown rice and diced avocado in lieu of making the cilantro cream drizzle. The mixture of textures and flavors is completely satisfying, but doesn’t feel too heavy. I’m looking forward to coming up with new ways to modify this dish!